The Department of Education (DepEd) Central Office issued DepEd Order No. 29, s. 2018 entitled Policy on the Implementation of Multi-Factored Assessment Tool to assess Grade 1 learners enrolled in regular schools, who may have exhibit developmental advancement or delays or have manifestations of learning disability. The Department of Education (DepEd), through the Bureau of Learning Delivery-Student Inclusion Division (BLD-SID), issues the Policy on the Utilization of Multi-Factored Assessment Tool (MFAT) to assess Grade 1 learners enrolled in regular schools, who may exhibit developmental advancement or delays or have manifestations of learning disability. b. assist teachers in planning and designing instructions appropriate for LSENs. This MFAT is a classroom activity-based assessment covering the five domains of learning: (a) Cognitive, (b) Communication, (c) Socio-Emotional, (d) Psycho-Motor, and (e) Daily Living Skills. The details of this tool shall be discussed in the Handbook of MFAT Administration. This policy shall take effect immediately upon approval, and should remain in force and in effect for the duration of the program, unless otherwise repealed, amended or rescinded. The Department of Education (DepEd) through the Bureau of Learning Delivery – Student Inclusion Division ((BLD-SID) envisions an inclusive school where everyone in the classroom is valued, respected and cared for and actively engages in the teaching-learning process. Learners with Special Educational Needs (LSENs) are safe and healthy, have a sense of belonging, and a full range of opportunities to participate meaningfully in the community and reach their full potential. The assessment tool is intended for use of trained Grade 1 teacher in identifying learners with special educational needs. The Multi-Factored Assessment Tool (MFAT) was developed to assist teachers for instructional planning and educational placement of learners. This policy shall be applicable to both public and private schools except when certain provisions are applicable only to public schools. 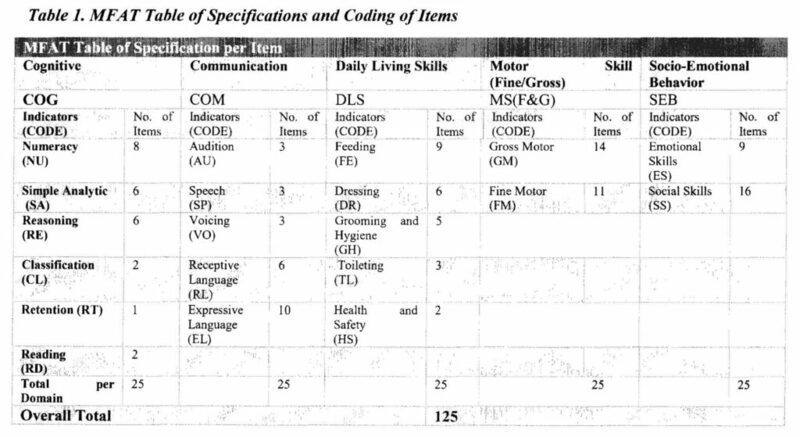 (5) Daily Living Skills Domain – shows the learner’s ability to take care of oneself in day-to-day needs such as feeding, hygiene and good grooming. The Multi-Factored Assessment Tool (MFAT) is a screening tool intended to gather information on learner’s strengths, needs, learning styles, and other educational concerns. It aims to assist teachers for instructional planning and educational placement of learners. It shall be conducted in all schools a month after the beginning of each school year by the trained teacher on the use of MFAT. This is a onetime assessment administered to Grade I learners enrolled in the regular schools who may exhibit developmental advancement or delays or with manifestations of learning disability. The DepEd Central Office through the Bureau of Learning Delivery- Student Inclusion Division -(BLD-SID) conducted the National Training of Trainer on the use of the tool and download funds for the Mass Training including the preparation of the materials needed for the training. To ensure that the teachers have the complete set of materials at the school level during the implementation, the schools are advised to use the MOOE funds for the reproduction of materials. The MFAT is an activity-based assessment covering the five domains (cognitive, communication, socio-emotional, motor and daily living skills) of learning. Each domain is a strong gauge to measure the child’s capabilities and /or needs. Only the Grade 1 trained teacher will conduct the assessment, enhancement and intervention. The data gathered from the result of MF AT provides immediate and appropriate intervention program. The result of the MF AT does not in any way, affect the performance of the learner, teacher, school, division nor the region. If the intervention made in the school did not make improvement and /or in academic functioning of the learner the school may refer the learner to allied medical specialist for further assessment. 1) Provide technical assistance to the divisions to ensure full implementation of MF AT. 2) Makes sure that all divisions have the complete set of materials. 3) Monitors the implementation to gather information and support the divisions’ need in the conduct of MFAT. 1) Assist the School Heads in orienting teachers on the administration of the screening tool. 2) Provide technical assistance to school heads and teachers during the enhancement and intervention process. 3) Monitor the implementation of MFAT to ensure the smooth delivery of enhancement and intervention programs. 1) Provides area/room for the conduct of the MFAT assessment. 2) Provides budget allocation for MFAT administration and other intervention, enhancement activities needed. 3) Monitors the smooth delivery of enhancement and intervention programs. 5) Organizes the room or space where the assessment activity will take place. 6) Summarizes the result for intervention or recommendation. 7) Packs properly the materials used and keep in the designated place. After each activity, an observation checklist has been included to record specific behaviour of learners during assessment. This will help validate the results at the end of the MFAT administration. The materials are essential for the successful implementations of the MFAT Test. 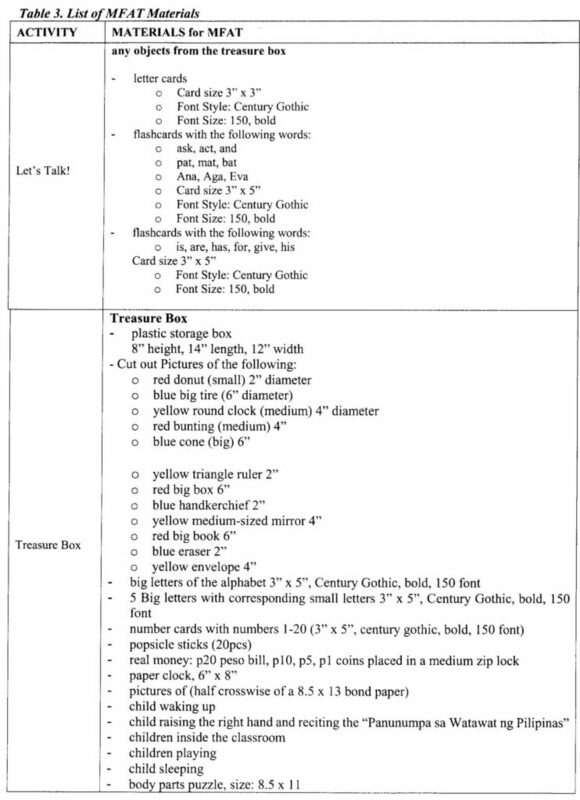 Table 3 below shows the materials needed to be prepared for each activity. To ensure the confidentiality of the assessment, assessors are expected to safeguard assessment tools, corresponding materials and results. The MFAT Tool should be kept or deposited in the guidance/principal’s office. 1) Identify learners who may exhibit developmental advancement or delays or with manifestations of learning disability and the Post test result of Early Childhood Development (ECD) Checklist should be considered. 3) Organize the room or space where the assessment activity will take place. 10) Thank the learner at the end of the assessment. The MFAT has script within each activity for easy referral and use of assessors. The Table 4 below shows the sample script and recommended sequence. “Good morning/afternoon (name of the learner)! How are you today?” (Be sure that the learner feels at ease and relaxed as he/she gives his/her response). 5) Read the instruction/s as stated in each activity. Ensure that you have a timer/watch to guide you with the time allotment per activity. Record time started and ended per activity on the space provided. a. Check (YES if the learner performed the task, or the item indicated was observed. If not, check NO and write in the LEARNER’S ACTUAL RESPONSE column the learner’s response or reaction towards the given task/activity. b. Observe the learner’s behavior during the activity. “We are going to take a short break. Are you still comfortable? Do you need to go to the comfort room or do you need anything? a. Give a few minutes for the learner to rest; go to the comfort room (as needed) and, get ready for the next activity. b. Use this time to pack materials you will no longer use. c. Prepare the next set of assessment tools and materials you needfor the succeeding activity. d. Ask the learner if s/he is ready to continue. The DepEd Central Office through the Bureau of Learning Delivery – Student Inclusion Division (BLD-SID) will provide the assessment tool and materials needed for the Assessment administration. The assessor should ensure that there are enough forms prior to the administration of the assessment. 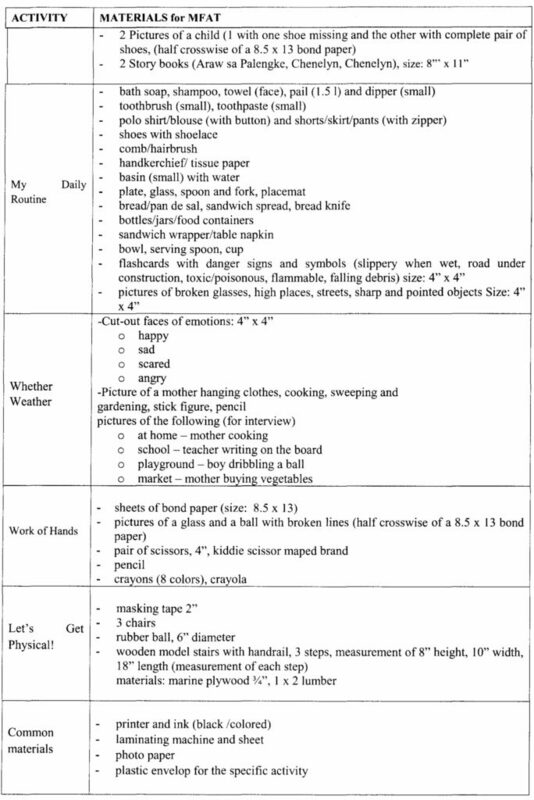 The Table 5 below shows the materials / forms for the Assessment. 1) Summarize the result for intervention or recommendation. 2) Pack properly the materials used and keep in the designated place. This policy shall take effect starting SY 2018-2019 and the succeeding year immediately upon publication of the Deped Order in the DepEd website and issuance at the Regional Offices and shall remain in force and effect unless sooner repealed, amended or rescinded.